Biotique Cleansers - Worldwide Shipping. 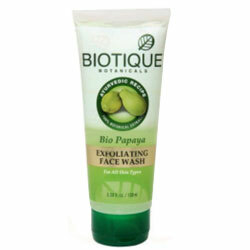 Dissolve dead surface cells, unclog pore openings & smooth way for clear skin. This fresh foaming gel is blended with pure papaya fruit to dissolve dead surface cells, unclog pore openings and smooth the way for clear skin to surface. Gentle refining action uncovers skin's natural brightness for a younger-looking complexion.